Paid parking is in effect from April 1 through October 31. Rates are $2 per hour (on street parking & municipal lots) and $3 per hour (Inlet Parking Lot). Handicapped vehicles (must have handicapped plates or a visible placard): A 30-minute courtesy period is given to all vehicles in the Inlet Lot, including handicapped. Municipal lots & on-street parking: one hour at no charge (must have handicapped plates or a visible placard). Learn more by clicking on a tab below or you may reach us at 410-524-0391 (M-F 8 am – 5 pm) and 443-523-4785 after hours. Inlet Parking Lot visitors can pay for the desired amount of time when you park or before you leave your parking space by paying for the amount of time you stayed. Remember, you’re first 30 minutes are free! You do not need to display a receipt on your dash. Instead, you enter your license plate at a nearby kiosk & the system will recognize your “paid time” based on your vehicle. (Note: You will need to know your complete license plate including letters.) You may also pay with the ParkMobile App. A violation of Inlet Lot Parking will result in a mailed bill of time spent in the lot at $3 per hour, plus a $25 administrative fee. This fee will escalate to $50 if not paid within 30 days. Patrons must pay for expired time prior to leaving the Inlet Lot to avoid being billed for additional administrative costs. $2.00 per hour with one hour free for handicapped parking (must have handicapped plates or a visible placard). To use on-street or municipal parking lot kiosks; park, take a moment to write down or snap a photo of your license plate, walk to the nearest pay station, enter your license plate number (including letters), the length of time you wish to stay, and your payment. You no longer need to post your receipt on the dash, unless a message is displayed on the kiosk. Unlike the Inlet Parking Lot, on-street & municipal lot parking requires that you MUST pay for your desired amount of time WHEN YOU PARK. Parking paid at 100th St. lot does NOT apply to parking at the Inlet, on-street parking, or other municipal lots. Need help? Call the number on the front of the machine for tech support and guidance on the machine and operation. While you’re in town, why not give your car a vacation, too? The West Ocean City Park & Ride offers FREE ample parking at 12848 Ocean Gateway. Not only is the parking free, but the lot offers spectacular scenic views of the bay, surrounding wetlands, the Ocean City skyline and of course, the gorgeous sunsets Ocean City is known for. Visit the octagon gazebos for amazing bird-watching. And be sure to read the interpretive signs and checkout the railroad bridge and brick walkways before catching the shuttle into town. Our 100th St. Municipal Lot (2 lots) is a trailer approved lot (Cars, Boats, Trailers, Oversize). Payment for this lot can be done with either Credit Card or ParkMobile App. Permits are available to registered participants of certain special events from event promoters including Cruisin’ Ocean City, OC Bikefest and Endless Summer Cruisin’ for a fee of $50. Enjoy the Beach & Boardwalk in OCMD. Watch the below instructional video for helpful tips on using our Kiosks. Do I have to place my receipt on the Dashboard? No, you can just pay & go! How does the enforcement officer know I have paid? Our on-street & municipal parking lot enforcement officers use a handheld device that displays a listing of paid plates. Our Inlet Parking Lot uses a camera enforcement system to verify payment. Do I pay when I park or do I pay when I leave my space? For parking on-street or in municipal lots: you MUST pay for your desired amount of time when you park. For parking in the Inlet Parking Lot: You can pay for your desired amount of time when you park OR you can pay before you leave the Inlet Lot by paying for the amount of time you stayed. Remember, your first 30 minutes are free. NOTE: The Inlet Lot is camera enforced and failure to pay will result in a billed fine for the amount of time you owe, plus $25. Can I extend my parking session at the Payment Kiosk? Yes! You can also EASILY extend your parking session through the PARKMOBILE app or by using a similar payment kiosk as your initial transaction. 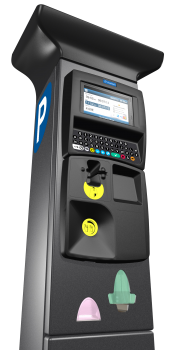 For parking on-street or in municipal lots: If you made an initial transaction at an on-street/municipal lot payment kiosk, you can extend your time from any other kiosk (excluding the Inlet Lot) up to the maximum time limit. 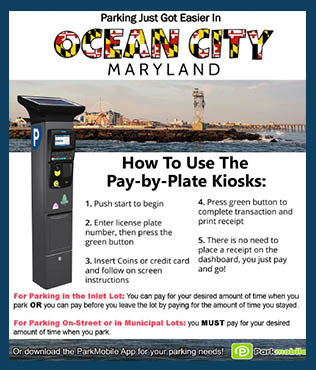 For parking in the Inlet Parking Lot: If you make a payment at the Inlet Lot you can ONLY extend at a payment kiosk in the Inlet Lot. Do Handicapped tagged vehicles have to pay to park? Yes! Our payment kiosks are handicapped accessible. However, for convenience, we do offer a 1-hour grace period for unpaid handicapped parking on-street and a 30-minute courtesy period at the inlet parking lot. Who do I call if my vehicle is towed?